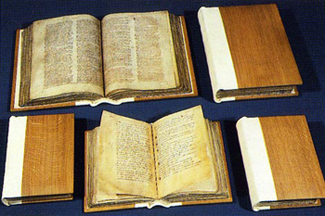 'Great Domesday and Little Domesday' still looking pristine 924 years after they were written. ompany Director Paul Wiltshire has written three books about England's rich and illustrious past. Together they describe the people, places, manuscripts and events, which moulded the English character and shaped the country into its present form. They outline the birth and growth of a nation and take the reader through the transition from Celtic to Roman and Anglo-Saxon to Norman. The books are offered as introductions to the nation's history and are intended to inspire readers to learn more. Explanations are provided in light, easily digestible form, which should therefore appeal to the majority. The works can be read in isolation or as part of a package. They are entitled, Why England?, Whose England? and Which England? Each book has been summarised under the respective headings.